Men's New Collection from $30 at Superdry Get the hottest and latest trends this season from just $30 at Superdry! Women's New Collection from $30 at Superdry Look hot to trot in the latest from Superdry today from only $30. Although born in Britain, Superdry is quickly expanding. Having opened its first store in London’s Covent Garden back in 2004, there’s now more than 500 stores across nearly 50 countries worldwide. This is a remarkable feat for a brand that hasn’t yet celebrated its 15th birthday. Superdry has stores everywhere from Sydney to Stockholm. Plus, with its online store shipping to more than 100 countries across the globe, this is truly a universal style phenomenon. Tap into this worldwide trend with something from Superdry’s timelessly stylish range of outfit options today. From jeans to jackets and from tees to thongs, you can craft the right look for any and every occasion. From the beach to the barbie, with a sweet selection of choices to pick from, you’ll feel cool and confident in your Superdry apparel. Check out what’s on offer from Superdry today. How do I use my Superdry promo code? If no code needed, your offer is included in the final price! Sign up to Superdry’s mailing list and be the first to hear about news, deals, discounts and competitions! Do Superdry offer free shipping? All orders from Superdry come with free standard shipping and should be with you in 3 - 5 days. Is there a Superdry store near me? Have a look at the store finder to find your closest Superdry store. What size should I buy from Superdry? 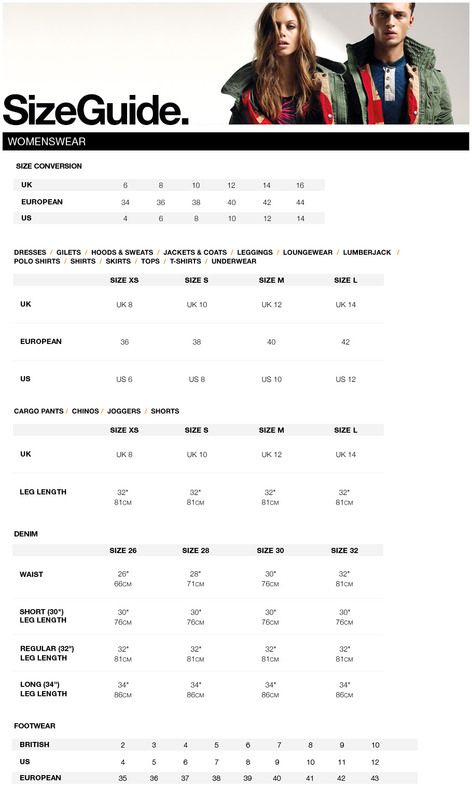 If you’re not sure about what size to get from Superdry, have a look at their size guides for men and women. Will I have to pay customs tax on my Superdry order? Superdry will cover all customs and duty charges when shipping to Australia. You can get in touch with Superdry using the contact form here. Superdry offers free delivery on all Australian orders. Superdry accepts returns on all items returned unused and in their original condition within 28 days of delivery. Find the opening times of your local Superdry store here. When you’re looking for an universally-popular aesthetic check out the outfit options on offer from Superdry. Since setting up shop in 2004 Superdry has rapidly established itself as one of the world’s favourite brands, offering incredible clothing, footwear and accessories to help you stand out from the crowd. Pick up a Superdry promo code from vouchercloud and you’ll be able to tap into this sensational new label without breaking the bank. For an aesthetic that is simultaneously classic and contemporary, you can’t do better than Superdry. This brand’s amazing aesthetic is a unique blend of Japanese design and vintage American graphics, conjuring up a visual that has quickly become characteristic of Superdry’s visual appeal. Feeling simultaneously familiar and fresh, this imagery conjures up evocative ideas of surfing in Japan and road-tripping down Route 66. With a wide range of cool, creative clothing lines for men, women and children, Superdry can offer you a distinctive style you won’t find anywhere else. When the days start getting shorter and the air a bit colder, make sure you’re ready for winter with one of Superdry’s great jackets. From gilets and windcheaters and from wax jackets to harringtons, you’re sure to find something that takes your fancy, and with a Superdry discount code you’ll save a pretty penny on everything from parks to puffas. Kill two birds with one stone by combining timeless style with weather-resistant utility with some outerwear from Superdry.